It was recently reported that all employees at Apple's new spaceship-style headquarters in Cupertino, California would be getting desks that gave them the option of working sitting or standing – a trend that is rapidly catching on in South African offices too. 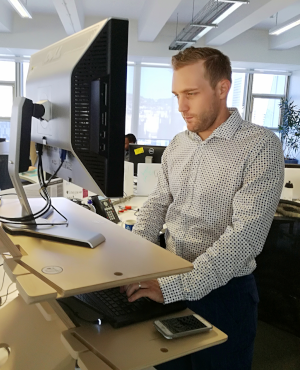 Richard Andrews, Managing Director of Inspiration Office, an Africa-wide office space and furniture consultancy, says that increasing numbers of their clients are asking for new desk installations that can accommodate workers who prefer to mix up the work day by standing and sitting. "In the past year we have had a nearly 50% rise in demand for desks that give office workers the choice of sitting or standing," says Andrews. He adds that the financial services and insurance industries in South Africa in particular have jumped on the trend, with some firms replacing the workstations for every staff member. "The return in efficiency in having staff that are able to adjust their posture at the push of a button, has more than outweighed the capital expenditure. "In our experience height-adjustable workstations are a simple way to provide for the well-being of an organisation’s most valuable asset – its people." Sitting all day is seen by health professionals the world over as the new smoking. Sitting is killing people slowly by taking a physical and mental toll on the mind and body. Often workers sit for eight to ten hours a day. Research shows that sitting for long periods of time contributes to risk of metabolic syndrome, musculoskeletal disorders, heart attack and stroke risk and overall death risk, among others. Those who sit a great deal also have lower life expectancies and slower metabolism. Dr. Hidde van der Ploeg, a senior research fellow at the University of Sydney’s School of Public Health in Australia, found that sitting for 11 or more hours per day increased risk of death by 40%, regardless of other activity levels. "People mistakenly think they can shrug off the effects of a long day by hitting the gym after work but you can’t," Andrews says. So how can office workers protect themselves? 1) Ask for a standing desk and set it to the right height. "There really is no need to stand all day. Ideally though, at least every other hour, workers should work standing for an hour," Andrews advises. 2) Office laps. Talking a walk around the office or even outside if time permits helps combat the strains of sitting. Try to walk at least every hour. 3) Active meetings. "Most meetings are too long anyway. Taking a loop around the block while talking to colleagues will get the circulation going and shorten the meeting," Andrews says. 4) Desk exercises. Stretching your arms and legs at your desk are a simple way to keep moving even while you’re seating. Arms reaching for the sky and extending legs forwards help improve circulation. 5) Set reminders. Increasingly, smart watches can detect if the wearer has been sitting too long and sends an alert to the user to get up and move around. "Alternately, a colleague buddy system of reminders is a good way to remind yourself to get up move every hour," Andrews says. He adds that the typical sit/stand desk looks exactly the same as normal desks, but come fitted with a lever or button on the side. All workers need to do is simply flip the lever and adjust the desk to a comfortable standing height and the reverse to set it back to sitting desk level.